Veteran’s Day research papers observe the ending of World War I.
Veteran’s Day was established to observe the ending of World War I; what history declares to be the war that ended all wars. Also referred to as Armistice Day, it has been said that fighting ceased between Allied nations and Germany in the eleventh hour of the eleventh day of the eleventh month. This is why Veteran’s Day is recognized on November 11th. It is a day that is regarded with somber pride and respect as much was lost yet gained; many soldiers lost their lives in order to provide America freedom. Businesses will observe the holiday by suspending business practices. Parades and public meetings are held. The President of the United States makes a speech. All of this takes place in order to preserve the historic meaning of what this particular day represents. By doing so, individuals are reminded of the day’s importance. November 11th marks a day in history that will never be forgotten. 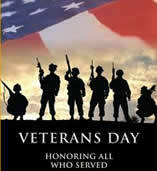 After all, it honors America’s veterans for their patriotism and overall sacrifice for the greater good. History of Labor Day - History of Labor Day Term Papers discuss how this national holiday came about and the founders. Agent Orange Veterans - Agent Orange Veterans research papers discuss what veterans are dealing with since being exposed to Agent Orange. PTSD Veterans - PTSD Veterans research papers examine the anxiety disorder that followed soldiers after the things the experienced during wars. Daily Life of a Marine in Afghanistan - Daily Life of a Marine in Afghanistan Research Papers look at what the marines do on a daily basis overseas. Nurse Corps - Nurse Corps research papers discuss how working as a member of the nursing corps is one of the most prestigious positions for a woman wanting to serve her country. Combat Stress - Military research on the problem of combat stress in soldiers and PTSS. Order a research paper on PTSS from Paper Masters. Paper Masters writes custom research papers on Veteran’s Day and observe the ending of World War I.